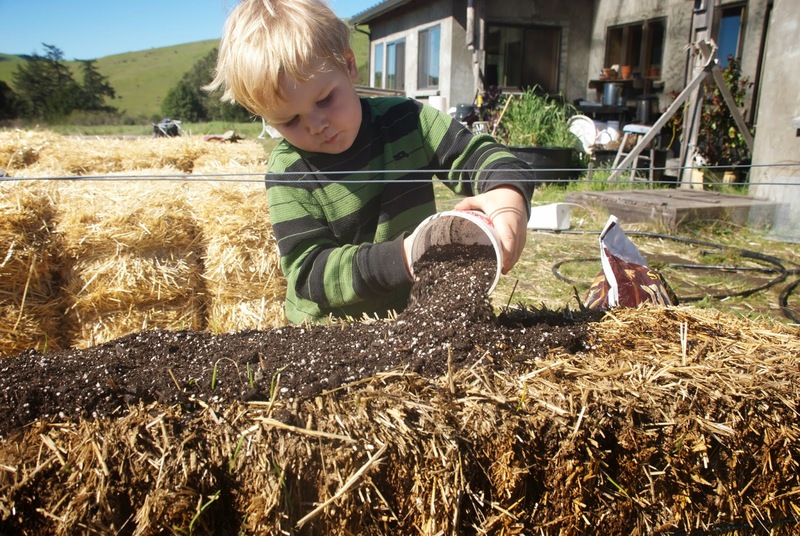 Last Sunday, which was a gorgeous sunny day, Gardner and I got busy planting seeds into our straw bales. As per instructions, we put a layer of potting soil on top of the bales, laid down our water line, and planted away. 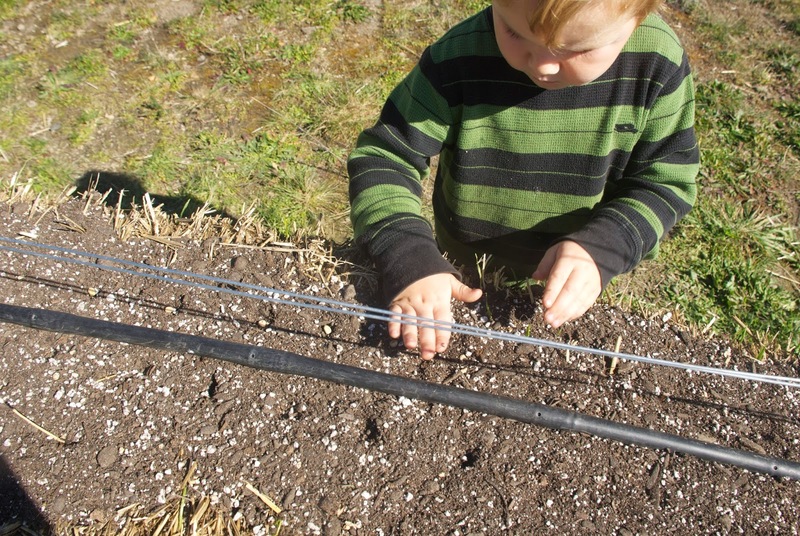 We planted shelling peas and snow peas, arugula, carrots, radishes, and beets. You can see what a big help Gardner was. He has asked me every day since we started conditioning the bales if it is time to plant yet. 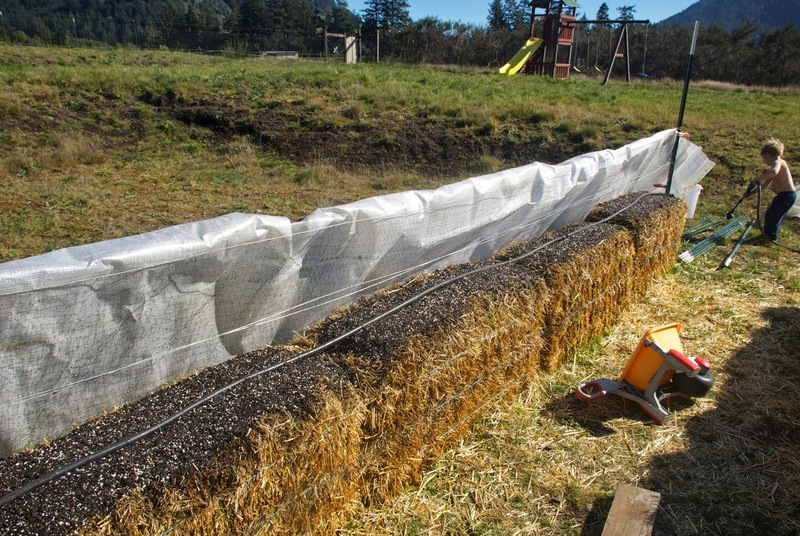 I put bird netting over the bed, because the little winter flock of dark-eyed juncos, sparrows, and scrub jays are very interested in the spare wheat seeds in the bales, and little birds often like to scratch up newly planted areas, or eat pea seedlings, especially. We are tearing down our big greenhouse, because it is in a bad location, and the plastic had torn, so we're cutting it up into pieces to use for our straw bale garden. I tried using one of these pieces, but that first night we had some of our infamous wind. It didn't want to stay put, and I was worried all the flapping might disturb our newly planted seeds. So I dug out our row covers, and that works much better, though I'm not sure it will provide much of a temperature buffer for the plants. We'll see. We have had frosty mornings the last few days. Looking forward to spring food, fresh stuff from the garden! I also started two additional beds of bales this weekend. They are lined up in the other direction. These two new beds are a total of 16 bales. I plan to plant all the brassicas, lettuce, and onions I planted in the cold frame a few weeks ago, plus potatoes. I'm feeling excited about our garden this year.